I purchased a new BBQ a few weeks ago and have been grilling up a storm. Our old BBQ had seen better days. It was given to us by my parents after they bought their new one. It was in rough shape after their gazebo roof collapsed on it. It still worked, but it was a sight for sore eyes. Let me just say having this new fancy BBQ has been a dream! If the weather is nice, I’m probably outside grilling our dinner. If you’re like me and are taking full advantage of BBQ season, then you’ll want to pay attention. I made the most scrumptious meal for my family. Think easy prep, quick cooking and fast clean up. Sounds great, right? It’s also my Cultured Kitchen challenge for July. I was tasked with creating a BBQ recipe with a unique Asian spin. 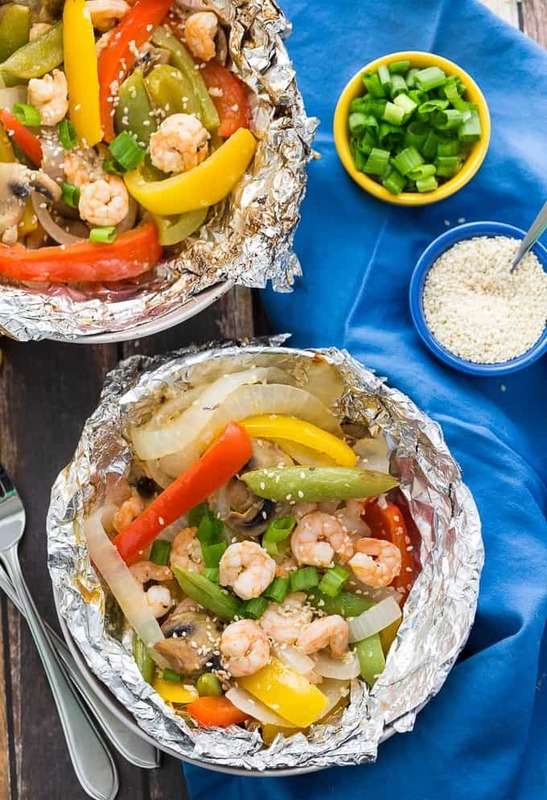 It’s “East Made Easy” with this Grilled Sesame Shrimp & Veggies recipe. Try it once and I bet you’ll be making it again for your family! For veggies, I selected green peppers, red peppers, yellow peppers, onions, mushrooms and sugar snap peas. Feel free to substitute in other veggies if you aren’t a fan of my picks. I purchased frozen uncooked shrimp that I let thaw in the fridge for about 10 hours before using. However, the real star of the show is the sauce. It gives the dish it’s Asian flair. You’ll need some garlic, rice vinegar, sesame seeds and Blue Dragon Sesame Oil. Feel free to make a little extra sauce if you like. It’s yummy on a fresh tossed salad too! You don’t need a fancy dish for your BBQ or anything like that. 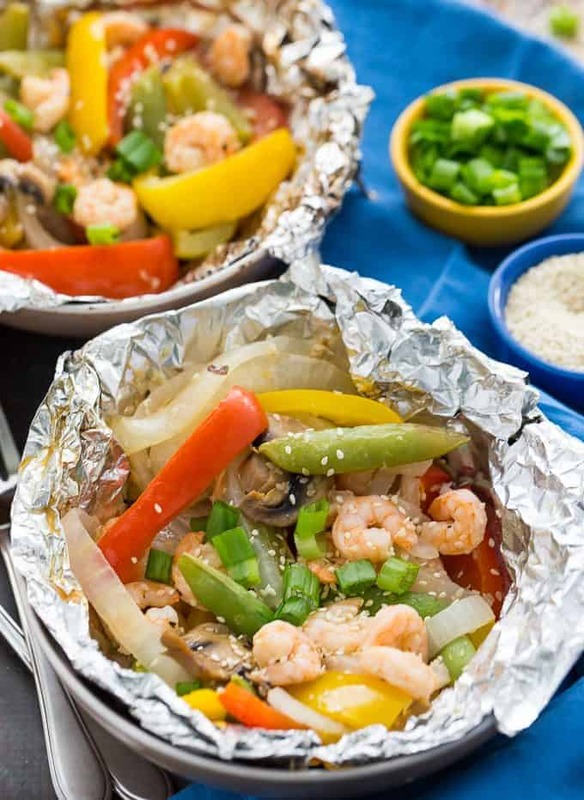 The veggies and shrimp are cooked inside aluminum foil packets. Simply cut a piece of aluminum foil about the size of a 9×13 baking sheet. Place your veggie mixture on one side of it in the middle. Top with shrimp and drizzle on your delicious sauce. Fold up your packets and make sure to seal the edges by folding them over too. It cooks on the BBQ for about 10 minutes at medium-high heat. Be careful when you remove and open them up because they are HOT! I’ve made veggies in foil packets before on the BBQ. I usually add green peppers, mushrooms and onions to them and serve them with steak. It was nice to try a little Asian twist to a classic summer recipe. I know I’ll be making this recipe again this summer! This recipe makes six servings and is an entire meal in one. You don’t even need to put them on plates or bowls unless you want to. Your friends and family can enjoy them right out of the packet. If you make them, let me know how they turned out! I’d love to hear about it. This summer grilling recipe is a triple whammy – it’s easy to prep, simple to cook and fast to clean up afterwards. 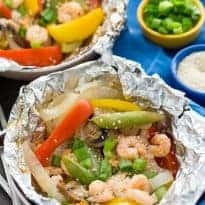 Your family will love these individual foil packets filled with veggies, shrimp and a mouthwatering sesame sauce. Toss vegetables together in a bowl. Rip off six sheets of aluminum foil, about the size of a 9×13 baking sheet and lay out on a flat surface. Add about 1 1/2 cups of veggies to each sheet, one one side. Evenly divide the shrimp and place on top of the veggies. In a small bowl, whisk together sauce ingredients. Add about 2 tbsp of sauce to each shrimp & veggie mixture and move around with a spoon slightly to combine. 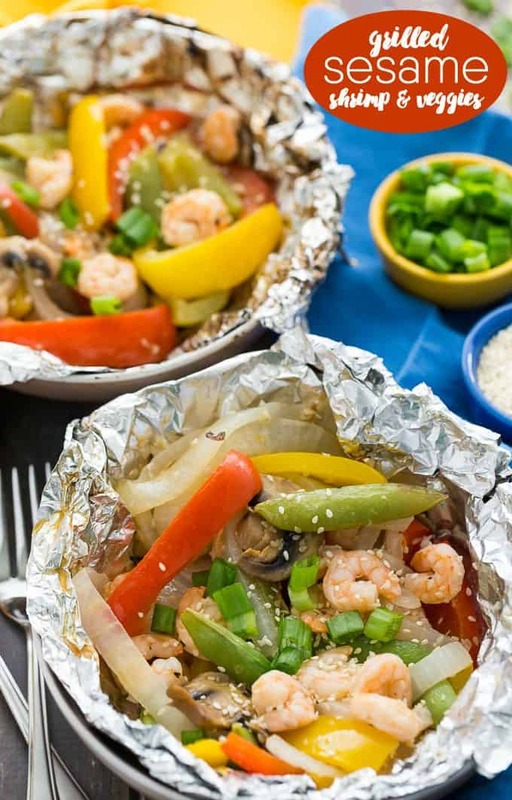 Fold up aluminum foil to make a packet. Fold edges to seal. Grill for 10 minutes on medium-high heat. Serve hot. I used Pacific White Shrimp (91 to 110 pieces) found in my grocery store’s frozen seafood section.